After the slaughter of the buffalo and the last of the Indian hunts, ranchers moved into this part of the Republican River country in 1875. Among them were I. P. and Ira Olive, who were using this canyon on their range in 1876. Herds of Texas cattle were delivered to them here before being driven north to Ogallala. 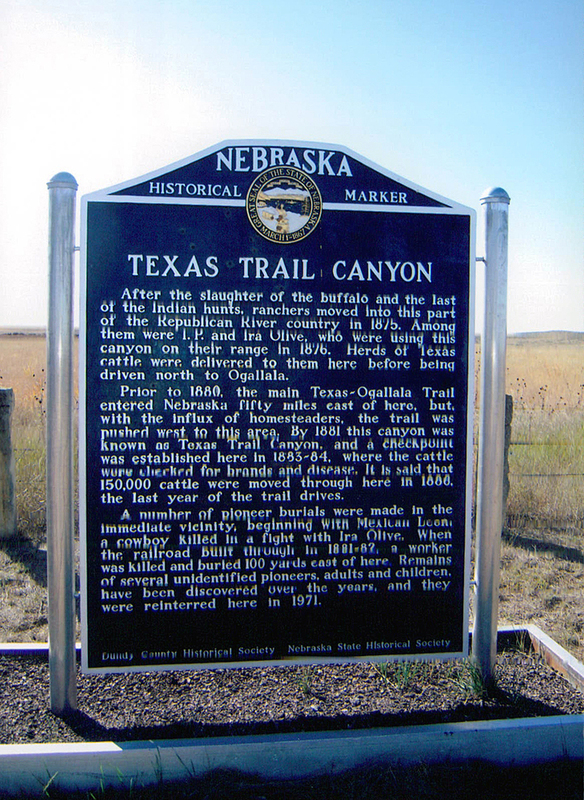 Prior to 1880, the main Texas-Ogallala Trail entered Nebraska fifty miles east of here, but, with the influx of homesteaders, the trail was pushed west to this area. By 1881 this canyon was known as Texas Trail Canyon, and a checkpoint was established here in 1883-84, where the cattle were checked for brands and disease. It is said that 150,000 cattle were moved through here in 1886, the last year of the trail drives. A number of pioneer burials were made in the immediate vicinity, beginning with Mexican Leon, a cowboy killed in a fight with Ira Olive. When the railroad built through in 1881-82, a worker was killed and buried 100 yards east of here. Remains of several unidentified pioneers, adults and children, have been discovered over the years, and they were reinterred here in 1971. “Texas Trail Canyon,” Explore Nebraska History, accessed April 18, 2019, https://mynehistory.com/items/show/204.